What if Devil May Cry Isn't as Different as You Thought? When DMC: Devil May Cry was first unveiled, all people could see (and react to, and shriek in horror at) was the lithe, sad-panda appearance of the series' protagonist, Dante. And they haven't reacted to much since. Perhaps it's because we're simply used to it now, but checking out DMC at Gamescom earlier today, I stopped noticing Dante's black hair and started noticing the game. 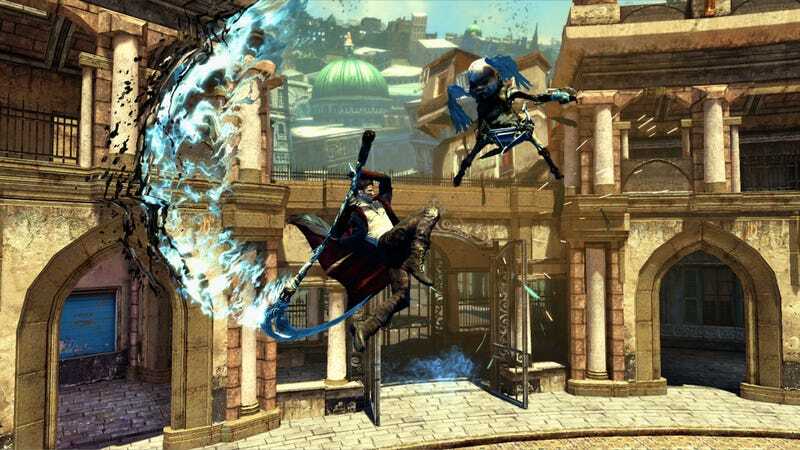 And how it looked exactly as you'd expect given its heritage: a Devil May Cry game with Ninja Theory's colour palette. Sadly, the event didn't allow for hands-on play with the game, but from what we saw in a live gameplay demonstration things were looking as Devil May Cry as they could be. Fluid player movement (and animation), acrobatic combat, corpse juggling, it was all there. What was also there was platforming. Serious, jumping and swinging platforming. To break up the action between fights, there's a feature in the game in which at certain points the levels themselves try and kill you. They do this by acting like Inception in reverse, in that they warp, twist, crack, move and slide all over the place creating chasms in one second and trash compacters the next. To get around this Dante had to jump, double-jump and sometimes even use a grappling hook/rope to save his skin. Series purists may baulk at this, but as far as ideas go to break up the monotony of constant combat, it seems like one of the better ones I've seen lately, especially as the effects of the level tearing itself apart looked wonderful. Some things weren't quite as wonderful. While Ninja Theory's love of colour and animation were evident in the centre of the screen, at the edges (and on inanimate objects) the polygon count and quality of effects dropped to concerningly-low levels. Here's hoping that's just something being left until later in the game's development to be cleaned up.